The overlook platform where a boy fell into the exhibit home to African painted dogs is seen at the Pittsburgh Zoo on Nov. 5, 2012. The fatal mauling of a toddler by African wild dogs at the Pittsburgh Zoo highlights an uncomfortable truth for all zoos: No exhibit is fail-proof. Striking a balance between providing a safe and yet authentic experience is an evolving science on its own, with the ultimate goal being to protect both animals and visitors, said Doug Warmolts, Director of Animal Care at the Columbus Zoo and Aquarium. 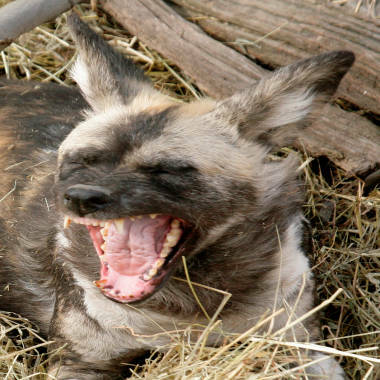 An African Painted Dog yawns at the Pittsburgh Zoo and Aquarium in Pittsburgh as he lays in a pile of hay Thursday, March 12, 2009. Maddock Derkosh, 2, fell into an African painted dog exhibit late Sunday morning at the Pittsburgh Zoo & PPG Aquarium. 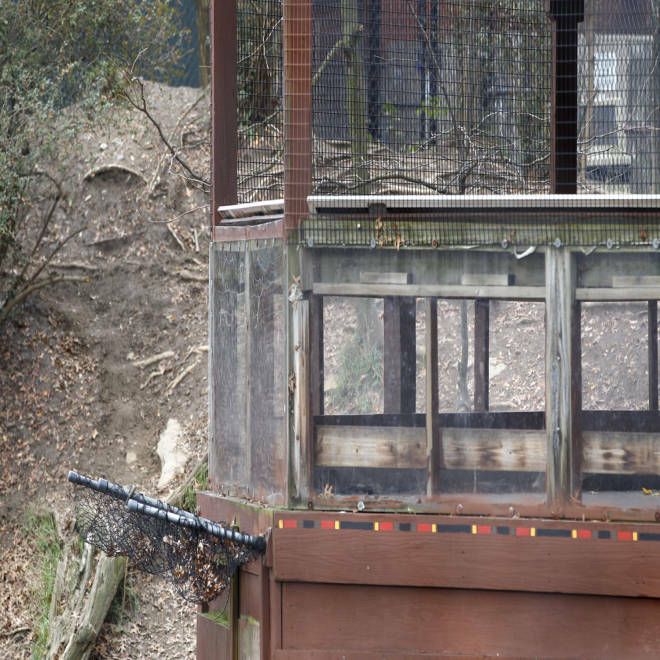 The boy’s mother had put him on a wooden railing at the edge of a viewing deck to see the animals, officials said, and the boy fell into the exhibit. He initially landed on the netting below the deck but bounced several times before dropping about 11 feet into the dog’s enclosure. Witnesses said at least three dogs surrounded quickly, attacking him at his head, neck and legs. An autopsy revealed Monday that the boy was killed by the animals, not by the fall. The exhibit housing the wild dogs remained closed Tuesday pending an investigation by police, who said it was still too early to determine whether criminal charges will be brought against the zoo or the boy’s mother. The zoo opened for visitors Tuesday. Accredited by the Association of Zoos & Aquariums in September – the gold standard for zoos in the U.S. – the zoo met or exceeded all safety standards for animals and visitors, Mary Baker, the zoo’s president and CEO, said Monday. Warmolts said exhibits at accredited zoos are designed by architecture, engineering and design firms that understand zoo animals’ behavior, from their abilities to jump, climb and dig to how to properly care and set standards for them in a zoo setting. “We have to blend those together to create an exhibit that’s not only a suitable and enriching environment for the animals and a safe experience for people to feel immersed into that environment,” Warmolts said. “We have fences and barriers and moats and signs and even zoo staff that can keep visitors at a certain distance from the animals. That’s why what happened is very rare. But we can’t always monitor them," he said. In San Diego, officials said the incident in Pittsburgh is likely to prompt larger, industry-wide reassessments. “The way humans interact with animals has changed drastically over the last hundred years, so certainly one of the things that zoos have had to be is highly adaptive, especially in these situations when tragic accidents happen,” Christina Simmons, a spokesperson for the San Diego Zoo, told NBC News. In Chicago, officials at the Brookfield Zoo said Monday that the events at the Pittsburgh Zoo have so far not prompted the change of any of their practices or protocols. "We have, like all other accredited institutions, procedures and policies that we follow in the event of an accident -- even a person having a heart attack -- and we also drill on those events too," said Bill Zeigler, the Brookfield Zoo's Senior Vice President of Collections and Animal Programs. Even with safety standards enforced, Wamolts said, the zoo industry is constantly dealing with "human error" by its visitors. "What happened is very rare," Warmolts said. "We’re always in the process of evaluating and reviewing and making adjustments as needed, and it’s an art to try and determine how to do that. What’s more common is people exhibiting inappropriate behavior. It’s just unfortunate." Medical examiners say a 2-year-old boy who fell into a Pennsylvania zoo exhibit was killed by the dogs and not by the fall. WPXI's Cara Sapida reports.